If you’ve been following my page for awhile you know that I have the tendency to stay pretty tight within Dallas proper. Yes, I realize there is a lot out there to explore but let’s face it, I just don’t have to leave all that much. The amazing restaurants, things to do and people have afforded me the luxury of staying within my bubble. Well, that is until I popped it one day, drove out to Downtown Fort Worth and fell in love with a spot called Vivo 53. Vivo 53 offers patrons absolutely delicious Italian fare with a stunning, easy-breezy approach that just draws you in. I like it so much, I actually went two days in a row! The pizza. Dear God is it delicious. Each pizza is made to order and then fired up in their massive pizza oven that greets you at the front door. The pizzas are just a tad larger than personal size so really they are just an excuse to order a few..you know, to share. 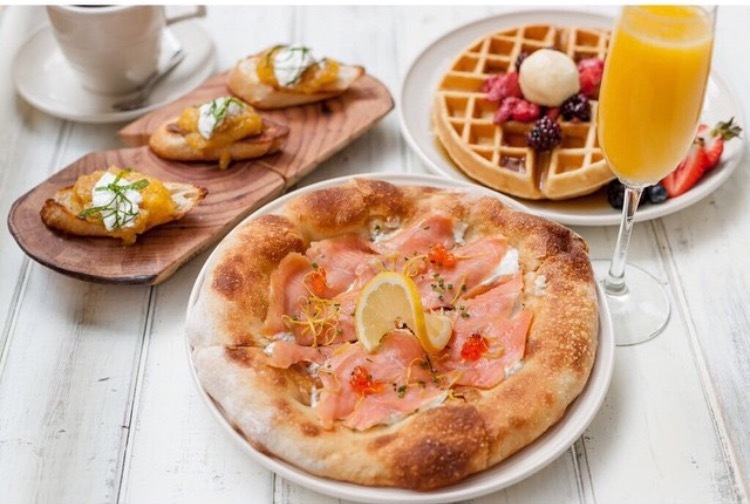 During brunch they feature specialty pizzas such as their Smoked Salmon and Fresh Berry Torta with house made ricotta! Speaking of brunch, the weekend brunch at Vivo 53 is available both Saturday and Sunday and features all kinds of goodies aside from the fabulous pizzas. Traditional brunch favorites like benedicts and waffles have a fun twist that feels both familiar and explorative. Perhaps best of all, Vivo 53 offers $1 Mimosas and Bellinis. Yes, you read that correctly. ONE DOLLAR MIMOSAS AND BELLINIS. Have you made your reservations yet? I know it sounds super cliché but one of my personal favorite aspects of Vivo 53 is how simply beautiful the presentation of the dishes is. Elegant and chic, it is clear that each plate is presented with care and thought which, in my book, goes a long way. 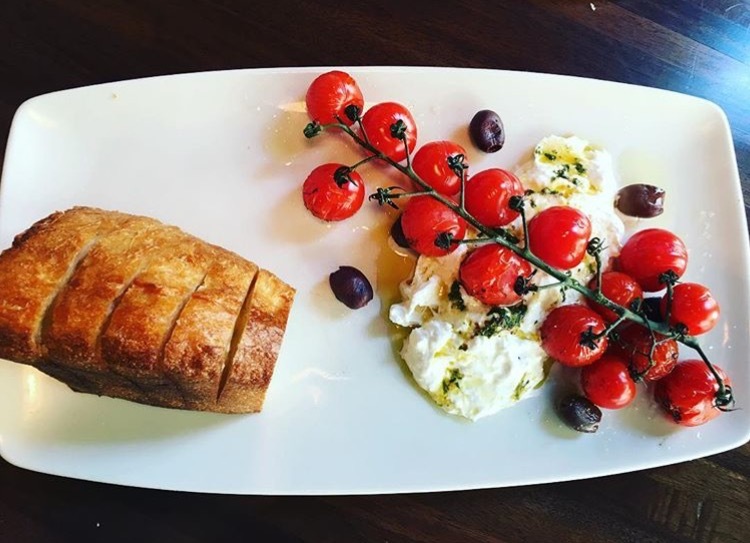 I mean, just look at this house made burrata with roasted vine tomatoes. Absolutely GORGEOUS! The specials! From an all-day happy hour on Sunday featuring $2 beers, specially priced pizzas and appetizers and more, Sunday Funday has a whole new meaning here at Vivo 53. On top of that, if you come in on Sunday or Thursday evenings from 5pm-9pm, you will get a complimentary bottle of wine with the purchase of two entrees. Hello, easy date night! 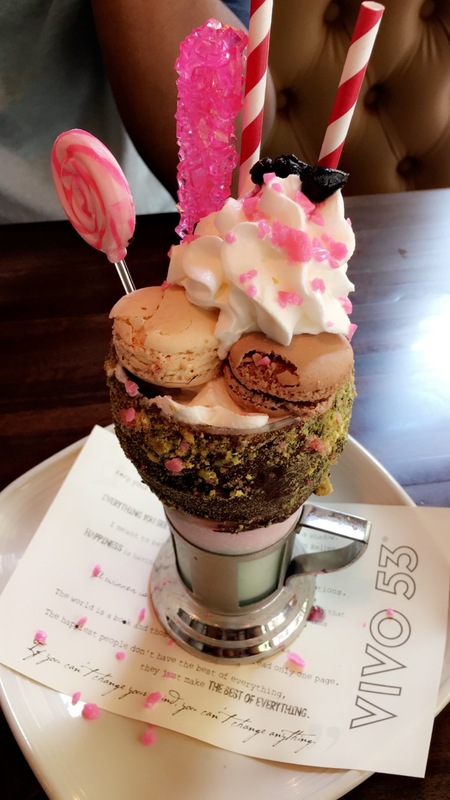 The brand new insane sundaes, which, are truly insane. Each one is hand crafted and made to order and the whole process takes about 15 minutes. 15 minutes to make one sundae, y’all! Layers upon layers of flavors literally hanging on to one glass, these things are absolutely amazing and are almost too pretty to each but when you realize there is an entire candy bar sticking out of your sundae you’ll soon snap back to reality and realize that you immediately need to shove it in your mouth. Currently, there are five flavors that are sure to please anybody’s sweet tooth. And check out this bonus – if you get a sundae and tag @Vivo53FortWorth on social media, you’ll be entered to win FREE insane sundaes for an entire year! But, if you win, you have to bring me, right? So, if these reasons haven’t totally made up your mind for you and left you licking your chops for the opportunity to head on over to Vivo 53, I guess I’m not doing my job. Seriously, if this post didn’t peak your interest at all, let me know! I’ll be the first one to drive you to the eye doctor to make sure your eyes are seeing things correctly. I can’t wait to hear about your experience at Vivo 53. Enjoy!